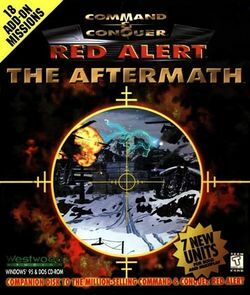 Command & Conquer: Red Alert: The Aftermath is the second of two expansion packs for Command & Conquer: Red Alert, and was released in 1997. Unlike the previous expansion packs, The Aftermath introduced some new units to both sides in skirmish and multiplayer , as well as some new missions and soundtrack additions. The majority of multiplayer maps were designed by Intelligent Games. 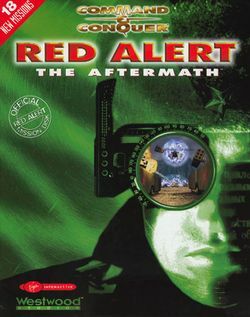 On 14 November 2018, it was announced that Command & Conquer: Red Alert would be remastered by Petroglyph Games and Lemon Sky Studios under supervision of Electronic Arts, along with the Counterstrike and The Aftermath expansion packs. Field mechanic - This mechanic can repair allied units instead of having them having to go to the service depot. The field mechanic is slow, unarmed and vulnerable, but his ability to repair vehicles is very useful. Chrono Tank - The Chrono Tank (when fully charged) can chronoshift itself. It is armed with precise missile launchers. Phase transport (available in Soviet missions) - This campaign-only unit is a stealth troop transport armed with a missile launcher. M.A.D. Tank - M.A.D. stands for Mutually Assured Destruction. When activated, the M.A.D. tank charges and builds up a shockwave. When detonated, it damages or destroys any vehicle or building in the area, along with itself. Infantry are not affected by this weapon. Missile Sub - This submarine is capable of attacking targets on land as well as sea. It is almost as powerful as an Allied Cruiser. It has an advantage that the Cruiser does not; it can submerge before the enemy knows what hit them. Tesla Tank - The Tesla tank has long range when it shoots its electricity blasts similar to a Tesla Coil. When a Tesla Tank shoots its electricity jolts it jams the enemy radar. Shock Trooper - These troopers shoot Tesla bolts, and can not be run over by any vehicles. Super tank (unplayable) - An advanced Mammoth Tank version equipped with Iron Curtain armor and autopilot computer. Created by doctor Demitri, but eventually rampaged out of Soviet control. Demolition Truck - A redesigned Supply Truck that holds a nuclear warhead. When the Demolition truck rams its target, the explosion causes massive damage in a large radius. Turrets cost $800 (from $600), use 55 power (from 40), deal 60 damage per shot (from 40), have a rate of fire of 35 (from 50), projectile speed of 50 (from 40). France: Command & Conquer: Alerte Rouge - Missions M.A.D. This page was last edited on 17 November 2018, at 22:30.